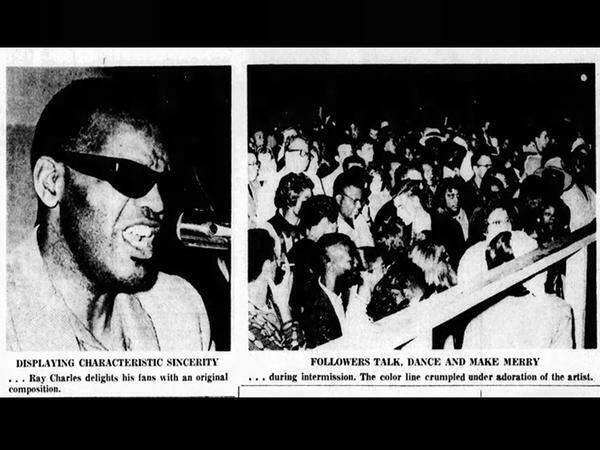 Photos from Ray Charles' 1961 performance at Campbell Park in St. Petersburg. The reporter who covered the event said "the color barrier 'dissolved' itself in the wake of admiration for a performer." Portion of a flyer for the Ray Charles Day celebration which will be held at the Studio @ 620 Friday evening. 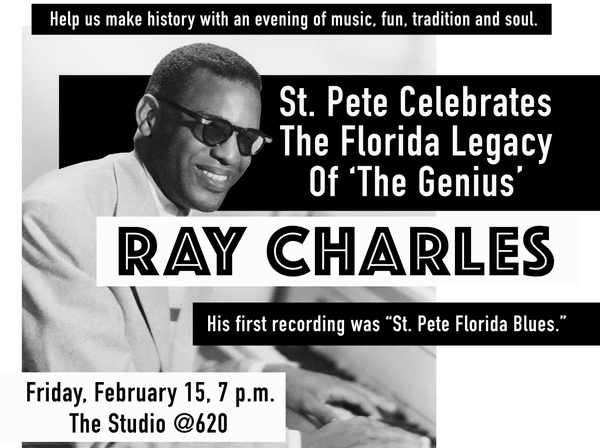 The City of St. Petersburg will declare Feb. 15 "Ray Charles Day" during a special event at the Studio @ 620 Friday evening. WUSF’s Stephanie Colombini talked about his ties to the Sunshine State – and Sunshine City – with Roy Peter Clark, senior scholar at the Poynter Institute. Clark played a vital role in making “Ray Charles Day” a reality. Listen to this conversation about Ray Charles' ties to Tampa Bay. Read a transcript of an extended version of the interview, which has been edited lightly for clarity. A lot of people may connect Ray Charles with Georgia because of “Georgia On My Mind,” but he has connections all over Florida. Explain those ties and how he made it Tampa Bay. His mother went to Georgia to have the baby but then returned to Greenville, Florida up in the Panhandle and raised him there. He wasn’t born blind, he was blind by the age of seven. And so his mother decided to send him to the Florida School for the Deaf and Blind in St. Augustine. It was there that his music talents and abilities were recognized and cultivated. He left in his teenage years and made his way to start a professional career. And if you kind of trace him on a map it would go something like Jacksonville to Orlando to Tampa, with stops in St. Petersburg, and then Miami. So almost every corner of the state, and so it may have been “Georgia On My Mind,” but it was really Florida that was in his soul. Yes, it’s an amazing piece of musical history. It’s the sweetest, warmest blues song you’ve ever heard. He found the girl of his dreams in St. Pete, Florida. The recording is a little rough because this was so early in his career, he hadn’t even developed his own voice, he was still imitating his idols like blues man Charles Brown. And he wasn’t known as Ray Charles, he was R.C. Robinson – Charles was his middle name. This was one of the first songs he ever recorded on a primitive wire recorder. And he wasn’t fussy about titles so another version of the song is titled, ‘Found My Baby There.” It’s later that the song is sort of rediscovered. I like to say that when you look at the competition between St. Pete and Tampa, Tampa got the university, Tampa got the professional football team, Tampa got the airport – St. Pete got the song. And I told the mayor of St. Petersburg back in November, I said, “Mr. 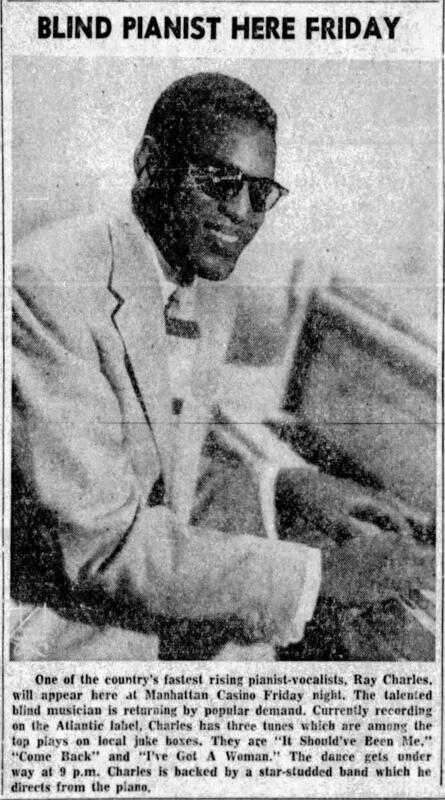 Mayor, did you know that in 1950 Ray Charles recorded a song called “The St. Pete Florida Blues?” If I had told him that Donald Trump had just got elected mayor of St. Petersburg or something like that, he wouldn’t have looked more astounded. So what we’re trying to do (with Ray Charles Day) is reclaim this legacy. And it has to do a lot with segregation, black audiences and white audiences being segregated in the Jim Crow era. He (Ray Charles) played there multiple times during the 1950’s and ‘60’s. And later on, into the 1960’s, his fame and his talent contributed to the desegregation of the city. In 1961, he performed in front of 2,000 people at Campbell Park, which is in the historically African American community. 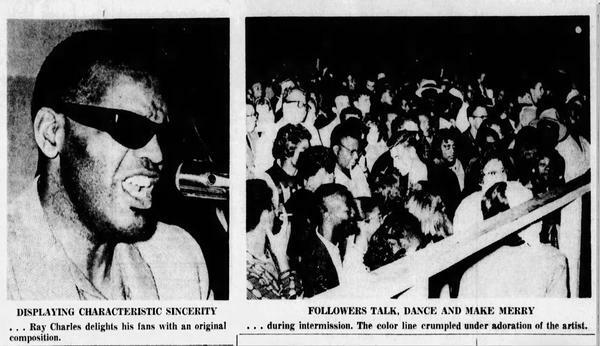 And the reporter who covered that event for the St. Pete Times said it was one of the first times someone had kind of erased the boundary between white and black audiences. I’ve seen photographs of the event in which white people are standing next to black people, looking at the stage, enjoying Ray Charles. View the one of those photo below and read the article at the bottom of the page. So he was a bridge builder from every musical and cultural standpoint I can think of. I heard the city has commissioned a mural of Ray Charles to be created in the area near the Deuces where he used to play. Tell me more about the Feb. 15, you mentioned the city has commissioned a mural. The city of St. Petersburg has said it’s making Ray Charles its “Adopted Son,” what does that mean? Well on Feb. 15, the proclamation will be read at the Studio @ 620, a great cultural venue in St. Pete – it’s sold out. The mayor and the deputy mayor will read the proclamation. We’ve gathered 15 musicians and we’re going to perform a dozen of his numbers, there’s other surprises. I do believe the interest that’s been sparked in this particular event will generate more activities, more concerts, more festivals, more artworks – maybe, also, more attachment to things he was attached to like generating resources for people with physical disabilities, such as blindness. It’s so rich, and I’m ready for a great period of musical innovation and creativity in St. Petersburg.